Welcome to another unique opportunity to get closer to God in preparation for the new year – 2017, Our Year of Access to Our Glorious Inheritance in Christ Jesus! You know when you have to stop to ask direction or explanation from someone who knows the way better than you? How you can’t effectively retain such information whilst still in motion? That is exactly what we want to do in this season of fasting and prayers: Stop and ask guidance from the Lord. Day 1: Thanksgiving, sanctification of heart and consecration. Day 2: Hunger for and understanding of the word. Day 3: Commitment and dedication to the word of God in 2017. How many of us can look back at 2016 and thank God for the distance traveled? For the LA family, God has been very kind to us, sustaining and helping us throughout the year to stay in the word together. The purpose of our fast is to simply thank God for a wonderful year with the word and to commit our 2017 into His hands. We commit our plans, our purposes, and everything that concerns us as a group and as individuals. A lot of us are tired and need a renewal of spirit and God promises that when we wait upon the Lord, we renew our strength. We want God, in this period of the fast, to renew our strength, and fill us afresh with His spirit. Our faith should increase. Our ability to hear from God – via His word and prayers – should be sharpened; and every doubt concerning 2017 should be cleared. We will not go into 2017 until we know God is with us. The LA Family believes in fasting. In both the Old and New Testaments we see a scriptural basis for fasting. (a) Moses fasted and brought deliverance to Israel. (b) David fasted in repentance before God when he committed the sin of adultery. (c) Daniel fasted to receive revelation from God. (d) Elijah fasted and experienced great anointing. (a) Jesus fasted when He was on earth and so did His disciples. (b) Church history reveals that fasting was practiced through the church ages and in the days of restoration. Accounts show that Luther, Calvin and Knox all fasted regularly. Whilst as a family we believe in fasting; before anyone embarks on a period of abstinence from food,the following guidelines are important factors to consider. (a) An individual can break at any time during the day providing they feel they have prayed sufficiently. (b) If an individual is on medication or is pregnant, we advise that they seek medical counsel. (c) In cases of fasting for more than half a day, it is advisable to drink fluid; for example water. (b) This heart of compassion can be reflected in distributing all saved food to the needy and less fortunate, if possible. The purpose of fasting is also about placing the body under discipline. For e.g. Going back to eat all the saved food during fasting negates the purpose of fasting. C) We should also place our minds under discipline. No unnecessary exposure to social media, unless you expect to hear from God via that channel ! 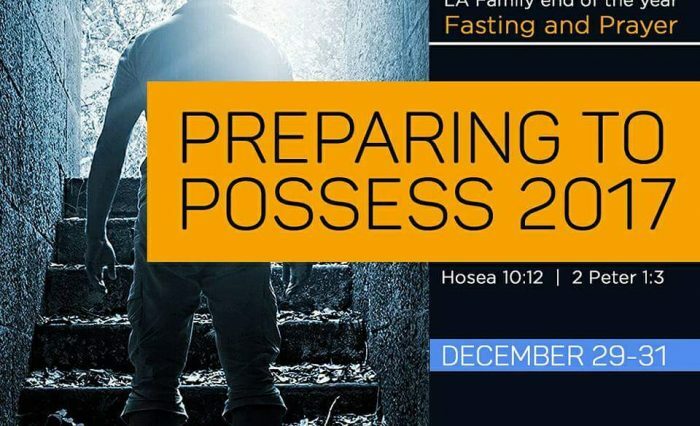 Members however are encouraged to visit the LA family’s social media accounts for updates regarding the fast, as well as via #LAfamPF, the PF representing prayer and fasting. What do you desire to receive and accomplish from fasting? This will determine the length of time. It is most important for you to fast until you sincerely feel that God has answered what you have made a sacrifice for as you fellowship with and wait on Him. It is not advisable to fast for a long period of time without preparing the body first. It is possible for the body to go for a long period of time without food but not without water. If you have a medical condition or on medication that requires you eat before taking them, it is extremely important that you consult your doctor, before engaging in a fast that requires more than 24 hours without food. Therefore we shall not bring the name of the Lord into disrepute. God bless you as you prepare yourself to fast.